Last Friday was inhospitable here, windy and rainy, so I did what any loyal American does in the face of bad weather: I went to the movies. My choice was Iron Man, and it was a good one. Even though I grew up reading comic books -- and Iron Man was among them, if not on the A-list with Spider-Man, X-Men, and The Incredible Hulk -- almost all superhero movies have fallen short of my expectations, which have been pretty low going in. (I’m not 8 anymore.) And it’s not like Iron Man changed my life, but it changed my rainy Friday afternoon. As everyone on the planet has said by now, Downey rips through the title role, which isn’t really shocking. The supporting cast is up to the task of dancing with him, and the movie deftly moves between the feel of a comic book and a story for grown-ups (well, immature grown-ups). The movie’s political context could be the fodder for term papers. I’m not usually one to read too much into a silly movie. (It was good, but these movies are inherently silly, no? I mean, it features people fighting each other in giant metal suits.) But it’s hard to avoid some reaction to the movie’s dual setting which is: the halls of the American military-industrial complex and Afghanistan. This politicized mood is not unique to the movie. As I found out during a rigorous research session in the dusty depths of the Library of Congress . . . OK, on Wikipedia: “In his premiere (comic in 1963), Iron Man was an anti-communist hero, defeating various Vietnamese agents; (Stan) Lee later regretted this early focus.” I read somewhere that, politically, the movie will satisfy both poles: If you’re a leftist, you’ll see plenty of American culpability in Iron Man; if you’re on the right, you get a healthy serving of American-produced might (eventually) righting wrongs. I agree more with A.O. Scott of the New York Times, who wrote, “the patina of geopolitical relevance is worn thin and eventually discarded...” But that’s not to say there isn’t a philosophy at the core of this movie. 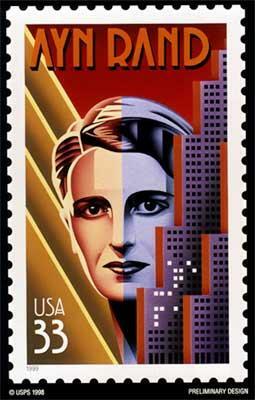 It is -- gulp -- the philosophy of Ayn Rand. Tony Stark (the billionaire who becomes Iron Man) isn’t a self-made success when the movie begins. At least financially. Yes, he’s a genius who blazed through MIT the way he blazes through women and liquor -- Doogie Howser meets Bill Gates meets . . . well, Robert Downey, Jr. -- but he’s also a child of privilege. He has inherited Stark Industries, a very high-end weapons manufacturer, from his father. The movie tracks Tony’s realization that weapons have fallen into the hands of some really bad Bad Guys, which is what inspires him to create the metallic outfit that allows him to fly to Afghanistan at greater than the speed of sound, etc. The core conflict, though, is between Tony and the military, which wants to use his inventions for their own purposes. As in Rand’s universe, the deck in Iron Man is stacked. Groups are evil, and Tony, the (literally) gleaming individual, is noble. And as when I was 16 and geeking out about The Fountainhead, there’s an appeal to this. (I remain closer to a libertarian than a socialist, but don’t like the idea of actually winding up in either camp.) You can see, though, why the movie’s conclusion is a bit scary. It’s true that placing justice in the hands of a nefarious bureaucracy is not ideal (as the great saying has it, a camel is a horse designed by a committee; and that saying is just about committees, not actively evil committees). But the alternative, in Iron Man, is to put justice in the hands of one erratic guy with a drinking problem who can destroy tanks by pointing in their direction. Uhhh, excuse me if I wait to see the option behind door number three. But really, Objectivist analysis aside, it’s an entertaining movie. You should see it, especially if it’s raining. That's how I first got into Iron Man, through the Sat morning cartoons. In fact, as I sat through the excellent movie, I was waiting for him to use the squiggly lines that came out of his hands in the cartoon. Never happened. Bridges character was making a power-grab, just like Ellsworth. Also: I heard Jon Favreau (sp) originally wanted to open the movie with Bob Downey naked on a mountain, embracing the day. I just finished reading The Fountainhead and as I was in bed last night suddendly the parallel with Iron Man just hit me starting with the name Howard Stark/Howard Roark. So I went online to see if anyone had had the same thought and it's good to see that I'm not entirely crazy.